We are very proud to release our MPA Series of single channel electronic pipettes to complement our already strong line up of high precision laboratory measurement equipment. 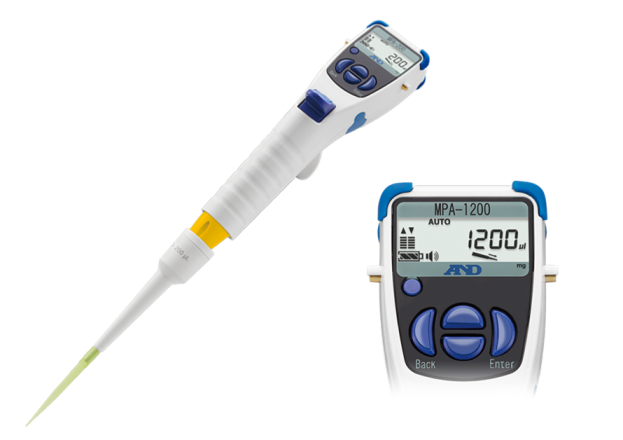 We believe the MPA Series will significantly increase the popularity of electronic pipettes by eliminating the difficulties researchers normally associate these devices. Its superior ergonomic design significantly reduces any strain on the users fingers, with effortless operation with the forefinger in a trigger style action, rather than the thumb operation associated with manual pipettes, which often leads to repetitive strain injuries. The MPA Series also feels surprisingly lightweight with a lowered center of gravity and compact design. The A&D Weighing MPA Series is operated with a high precision stepping motor and also frees users from expensive external calibration services with simple calibration functions (for both volume and weight) which can be performed in-house. With these features users can be assured of consistent, reliable results and realize uniform pipette operation for both novice and expert alike.